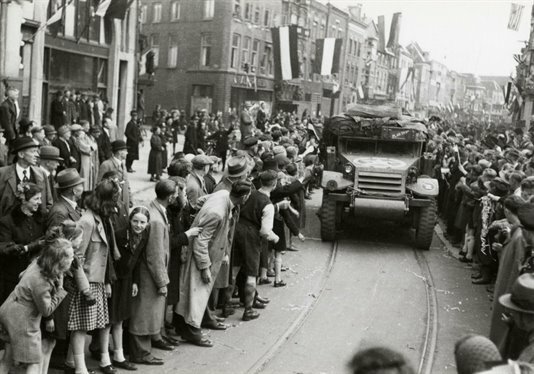 I posted Monday about Bevrijdingsdag, the liberation of the Netherlands at the end of World War II, but also mentioned that the allied forces didn’t arrive in Utrecht until 7 May. 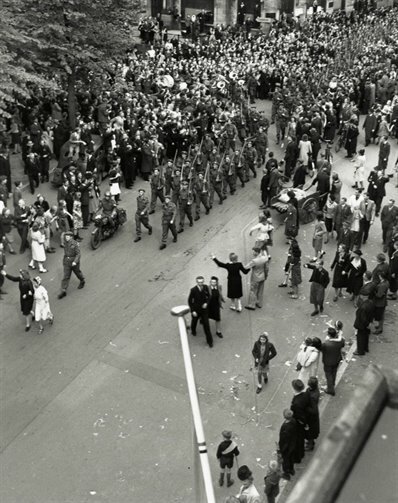 Today marks that anniversary, so I thought I’d share a few of the photos from the Utrecht Archives showing the anticipation and arrival of the troops. 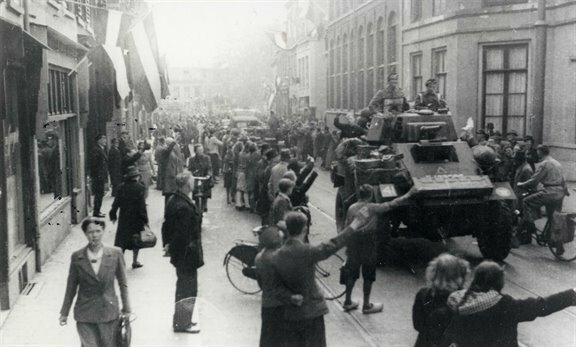 They came through Biltstraat in order to enter the old city center at the Wittevrouwenbrug. They followed that street, which becomes Voorstraat, before eventually making their way through the rest of the city. 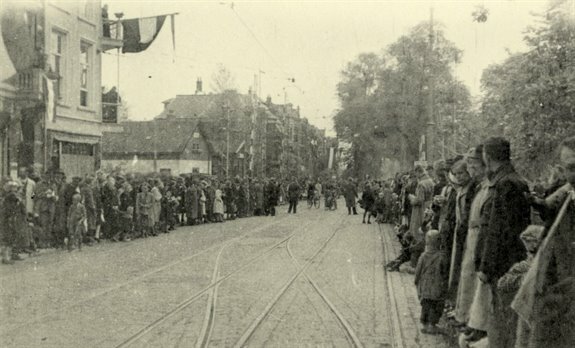 People lined the streets in masses to celebrate their arrival. The photos I’ve chosen start with people waiting for the forces on Biltstraat and then follow them down Wittevrouwenstraat and Voorstraat. Among the allied forces that played a part in the liberation of Utrecht was the CanadianEnglish 49th Reconnaissance Regiment, known as the Polar Bears. (See comment below.) They’re seen marching along Janskerkhof. There’s now a Polar Bear monument dedicated to the regiment at a spot on Biltstraat. There will be a memorial service held there this evening. 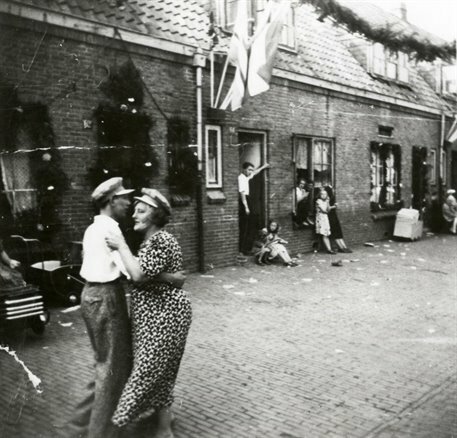 Finally, a charming photo of a couple dancing in celebration in Framboosstraat. All photos via Het Utrechts Archief. This entry was posted in history, holidays, photos, time travel and tagged allied forces, Bevrijdingsdag, historic photos, liberation of Utrecht, polar bear regiment, WOII, WWII by Alison. Bookmark the permalink. Thanks for the memories, Alison, even though I didn`t live in Utrecht but nearby. These are wonderful photos. One point of correction: Polar Bears was the nickname of the Duke of Wellington`s Regiment of the 49th (W.R.) Division of the British Army. They were not Canadians, though at the time the division, together with the First Canadian Division, made up First Canadian Corps. Units of the Duke of Wellington`s Regiment liberated my hometown. For years I thought my father was mistaken in insisting the Polar Bears were English, not Canadian, but when I did research in Ottawa`s National Archives in the late 1970s for a book on the Canadian forces in the Netherlands I discovered my father had been right all along. Ah, thanks for the information! I knew the Canadians had played a large part but hadn’t realized the Polar Bears were separate. Always good to learn something new and interesting! That winter before was a dreadful time. It was the overrreach of the ‘Bridge Too Far’ (see movie). The Germans were pulling back, The Dutch celebrating – then the allied push stalled. The Germans dug in, forced back in the Ardennes. repercussions on the Dutch were harsh: the Germans cut off all food supplies, people were starving to death. 10.000 are estimated to have died that winter. Do like the woman walking on:’business -as-usual in the 2nd photo! Last Sunday (4 may) the southern part of the Netherlands (hometown in Limburg: Brunssum) celebrated the liberation and also national memorial day. But i must say I find it very difficult to imagine how those times were to live in as an 80’s baby. As a tribute a Lancaster bomber flew people where cheering but It was not until the evening I realized that at the time of war equal type bombers flew over every 1,2,5,10 minutes with a possibility to open fire. It must have been a pretty scary time and hope we this type of human misbehavior less and less. I think the constant noise and threat from the bombers must have been truly awful. I get vaguely paranoid just hearing small prop planes flying low overhead. “Polar Bears” was the nickname of the 49th West Riding Infantry Division. It got this name after part of the division served in Iceland. The 49th Reconnaissance Regiment was its reconnaissance batallion, a unit of less than 1000 men. I absolutely love that last shot! What different times we live in … it’s so difficult to imagine the way things must have been back then. The last photo was my favorite, too. I can only imagine the relief they must have felt after everything they’d gone through.